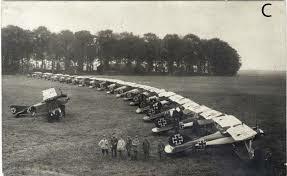 German fighter units began to achieve elite status. Led from the front by inspirational and experienced fliers such as von Richthofen, the Jasta pilots continued to exact a heavy toll of the probing Allied two-seaters that penetrated their airspace daily. Mainstay of the German squadrons in early 1917 was the Albatros D.III, followed into service by the Albatros D.V, then D.Va. Designed as up-graded versions, they offered scant improvement and D.III production continued. The ‘Vee’-strutted wings were not their only obvious recognition features – von Richthofen had his Albatros fighters painted bright red. This was partly to boost the morale of the German infantryman, whom he held in high regard, but also to aid recognition in the air. The colour was adopted by fellow Jasta 11 pilots who employed different colours on parts of their machines for easy identification. This applied to most all the Front-line Jagdstaffeln and the combination of unit markings coupled with pilots’ individual liveries and emblems resulted in an explosion of colour. As his victory tally increased along with his fame, der rote kampflieger and his gaudily-hued brethren became a familiar sight over the pock-marked morass of the Western Front.